Mexico has so much to offer, but be prepared to give up your personal rights. Even flying low on the radar can get you suddenly stopped one day as you’re walking in the park. Most always, it’s just a cop who is hoping for a few pesos under the table, but nonetheless it can be intimidating. A good friend in his sixties was walking the waterfront of Lake Chapala in the state of Jalisco, and suddenly found himself in the middle of two motorcycle cops. They searched him “for drugs” and detained him with nonsensical accusations. He was not smart enough to offer them money – or maybe not smart like a fox – and eventually the motorcycle patrol assumed they had a dumb gringo on their hands who didn’t understand their motive, and let him continue his walk. He didn’t make a deal out of this encounter, but it happened again a couple of months later. He writes it off as payment for living where he wants to live. I personally consider it an intrusion of the most unwelcome kind and wonder what it could lead to next? I was stopped at the post office in Cancun one day for no apparent reason by a local police officer. He told me I needed to pay a fine for parking. Since I was parked in a legitimate spot in front of the building, I played dumb. It was clearly a shakedown of what he perceived as a naive gringo. I had been doing business in Mexico for a couple of years at that time, so I knew what he was up to. I didn’t have much money on me and I needed to get supplies. The trip home was an hour away and I didn’t feel like giving him my cash and shorting the household provisions. I told him I didn’t have any money, but would come back later that night at 7:00 with pesos equivalent to $20US. Naturally, he was skeptical, so I offered him my international driver’s license to hold as security of my assured return. I went about my way and of course never returned. International driver’s licenses at that time weren’t worth the paper they were printed on, but they looked very official. The next time I had business in the States, I would just get another. In the meantime, I avoided the PO for awhile, arranging for someone else to take care of that task. 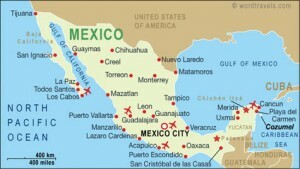 So living in Mexico has advantages, but be prepared to experience the occasional shakedown now and again. Personally when I was younger, it didn’t bother me and I accepted it as part of life, but as I get older I don’t want to deal with this kind of compromise. Leave a comment below. Do you have a story to tell about living in Mexico?